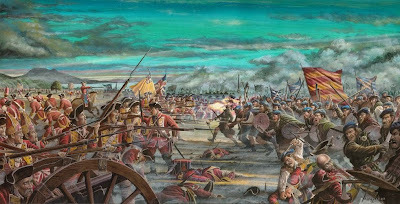 Battle of Prestonpans by Andrew Hillhouse. The Jacobites rush in to overwhelm the government army, with Clan Cameron capturing the enemy artillery. The government line begins to falter and will soon dissolve into a complete rout. Charles and his commanders had the advantage of local knowledge, provided by a Mr Robert Anderson of Whitburgh in East Lothian, who told them of a concealed narrow track crossing the marshy ground immediately east of Cope's position. A rapid reconnaissance verified this and established that Cope had not even thought of placing any sentries on that side. 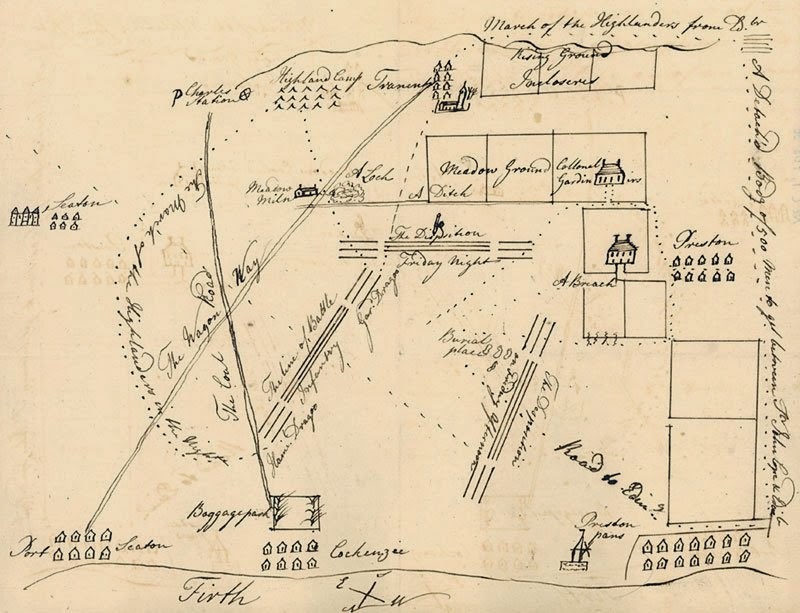 At 4 a.m. on 21 September, the Jacobite army was ordered to move off in silence, while it was still dark. The MacDonalds of Clanranald, Keppoch, Glengarry and Glencoe pulled ahead under the command of the Duke of Perth. They would become the right wing of the Prince's army when it turned to face the enemy. They were followed by the Duke of Perth's Regiment, the MacGregors, the Stewarts of Appin and the Camerons of Lochiel, who made up its left wing under Lord George Murray. The cavalry was left behind in case the neighing and snorting of the horses alerted the enemy. Not until daybreak did Cope's sentries warn him that the Prince's army were now only 800 yards away on his left flank, where he least expected them, looking `like a black hedge moving towards us'. By outflanking the enemy with such a daring manoeuvre under cover of darkness, Murray had achieved the crucial element of tactical surprise. Cope immediately ordered his army to wheel around to meet this new direction of attack, but his men were inexperienced and the manoeuvre was disorganised. Even so, he managed to place his 2,000 infantrymen in the centre of his line, flanked on either side by dragoons. The few field guns he possessed were now on his right wing, guarded by a detachment of infantry. His army was almost completely unprotected. Thick mist still obscured the movements of the Prince's army as it assembled in lines of battle with some difficulty, so that the left wing started to advance slightly in front of the right. The Highlanders emerged from the mist only 200 yards from Cope's lines, forming themselves into the tightly packed wedges that gave the Highland charge its devastating impact. With a single, terrifying war cry, they broke swiftly into a run and hurled themselves at the Hanoverian lines, although they wavered under sustained fire from the dragoons advancing against them. Even so, the Highlanders returned the fire with a single volley and then threw down their muskets to run at the dragoons, slashing with their swords at the muzzles of the enemy's horses, which bolted. This ferocity drove back the dragoons, who soon fled the field at full gallop, leaving Cope's infantry to its fate. Colonel James Gardiner was almost alone in staying to fight, dying on the battlefield. General Wightman believed that `he prayed for it, and got his desire; for the state of his health was bad, and his heart broken by the behaviour of the Irish dogs whom he commanded'. At the far left of the Jacobite line, the Camerons of Lochiel, under Murray, were the first to engage the Hanoverian infantry in hand-to-hand fighting with sword and targe, and, without the dragoons' support, it buckled almost immediately. By then, the Camerons had overwhelmed the artillery on Cope's right wing, stopping the guns after they had only fired a few salvos. However, the Highlanders did not have the expertise to use the field guns effectively. Elsewhere, a dangerous gap had opened up in the centre of the Jacobite lines, which might have allowed Cope's infantrymen to set up a devastating crossfire. Just as the Camerons had veered left in charging the enemy lines to prevent Gardiner's Dragoons from outflanking them, so the Mac- Donalds, under the Duke of Perth, on the other wing swerved in the opposite direction, concentrating their attack against Hamilton's Dragoons to their right. However, the gap was plugged almost immediately by the Jacobite troops in the second line. Cope's infantry were badly trained to meet such a charge and unnerved by the `fierce, barbarous and imposing aspect' of the Highlanders, they discharged their muskets too soon. They had no time to reload before the Highlanders were at them and their bayonets were not fixed for hand-to-hand fighting. The battle was now a rout, as Cope's infantrymen broke under the onslaught of the Highlanders. The casualty figures are revealing - just over twenty Jacobites were killed and only fifty were wounded, while 300-400 of Cope's army died (including five or six officers) and another 500 were wounded. 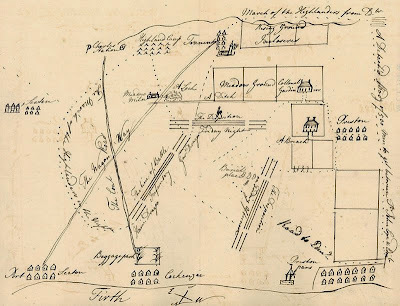 Fifteen hundred of Cope's men were taken prisoner, trapped trying to escape through a narrow gap south of Preston House. The battlefield itself `presented a spectacle of horror, being covered with heads, legs and arms and mutilated bodies; for the killed all fell by the sword'. Even the army surgeons said `they never saw such terrible gashes as the Highlanders made with their broadswords'. The carnage was made worse because the Jacobite officers found it difficult to stop the slaughter. When Charles Edward Stuart arrived on the battlefield to find Cope's army in headlong flight, he pleaded with his troops to `make prisoners, spare them, they are my father's subjects'. were killed in cold blood . . . the foot seeing themselves naked and defenceless, and the enemy rushing impetuously upon them sword in hand, they threw down their arms and surrendered prisoners. But the merciless enemy would grant no quarters, until they were compelled by their superior officers. The unheard of manner in which the dead were mangled and the wounded disfigured was the great evidence of the truth of this. However, the nature of the Highland charge as a military tactic made such casualties almost inevitable, since it could only succeed by taking on a momentum of its own. The belief that the Highlanders gave no quarter to the Hanoverian troops at Prestonpans made it much easier to justify the ghastly butchery that followed Culloden. Cope himself fell back to the west, where he found the remnants of Gardiner's and Hamilton's Dragoons. He then rode south through Lauder and Coldstream, reaching Berwick the next day, where he apparently brought news of his own defeat in person. He left behind an army utterly destroyed, even if those prisoners eventually released on parole by the Jacobites did not honour their promise not to fight again.